The most recent scarf knitted in linen stitch has been bound off and blocked! Now that it is dry, I can show you its cheerful nature. The scarf is based very loosely on Churchmouse’s Koigu Linen Stitch Scarf, which I have knit several times with multiple hand-painted yarns. This time I wanted to use Kauni 8/2 Effektgarn with its long color changes. 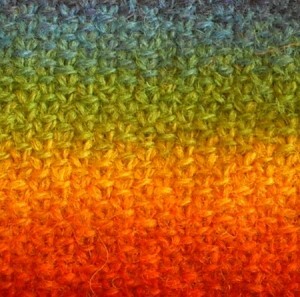 One ball of their most popular rainbow colorway, EQ, knit up into a fantastic scarf measuring 7 1/2″ x 70″ long excluding fringe. I started with 470 sts and the knitted cast on with a US 7/4.5mm circular needle. At each end of the cast on and every row, I left a generous 8″/20 cm tail at each end; the tails later become fringe. All rows are worked from the same side, the side that has knits combined with slips. No purl-side rows whatsoever. The point in using Kauni is to take advantage of the slow color changes, which are further blended by linen stitch. This means drawing consistently from one end of the ball of yarn. Red transitions to red-orange, which becomes orange, then yellow-orange, yellow, etc. Kauni EQ repeats the same color sequence twice in one ball. My friend Laura suggested that I mirror the color sequence rather than let it repeat in the same order. I loved the idea! To make that happen, I worked consistently from the outside of the ball of yarn until the color on the needle matched the color at the inside tail. After finishing that row, I began using the inside tail as my working yarn and did so for the remainder of the scarf. When the color sequence nearly matched the cast-on color, I worked the last row of linen stitch with a slightly larger needle, US 8/5mm; this elongates the knit stitches just enough that they will lie a little flatter when incorporated in the bind off. Bind off on the next row, keeping the tension as similar to the rest of the scarf as possible. 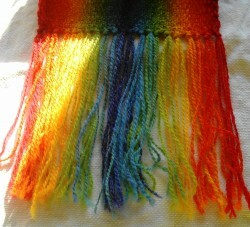 Fringe at end of Kauni Linen Stitch scarf – in color pattern! The long tails left at the beginning and end of every row become fringe. Wonderfully coordinated fringe in the same sequence of colors. I prefer to knot the fringe as I go. Especially in a traditional wool like Kauni, the tails can become mixed up, and when all the ends are loose, the stitches at and near the edge of the scarf become loose and inconsistent in tension. It is easier for me to knot every time I have 4 ends. While I knot fringe as I go, I do not trim the fringe evenly until the scarf is complete. Blocking is the very last step. With linen stitch, knit bunched up on a circular needle, blocking is essential. It makes the difference between rumpled fabric and smooth fabric. I washed the scarf and laid it flat to dry. It was dry later the same day. This particular scarf is a donation to a great cause. Will I have to knit myself another one? Quite possibly. My friend Dawn is knitting the same scarf now, and it is too much fun to watch the color changes from the ball of EQ she has. 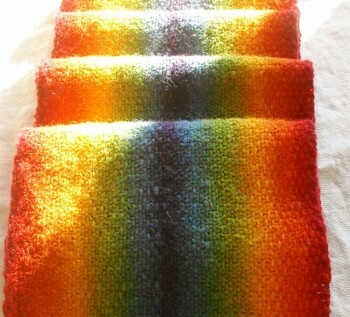 This entry was posted in knitting and tagged colorwork, fringe, gradient, one-skein, scarf. Bookmark the permalink. Thank you! It surpassed my wishes. Don’t we love it when that happens?! I’m working on a linen stitch scarf right this moment (more subtle colors, though), except I’m also doing a purl side row. My next one (because there will be another) will only have knit rows. Yours is absolutely GORGEOUS. I only hope mine turns out so well! Thanks! Can you make the change now to the only-knit-side strategy for linen stitch? It makes linen stitch much easier, even for those of us who like to purl. Subtle gradations are wonderful in linen stitch. Using this vivid color group is the exception rather than the rule for me. I, too, am planning my next one.